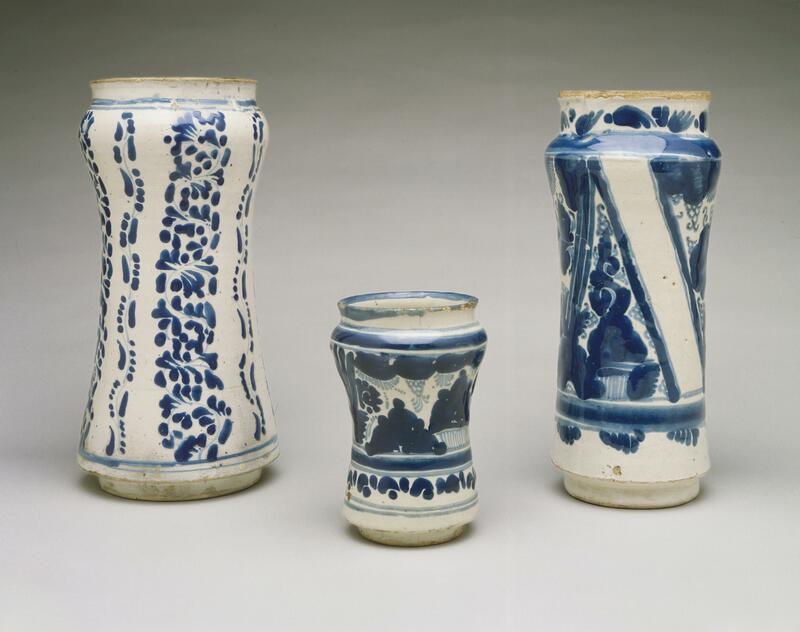 These three vessels are examples from different sets of jars used to store herbs and other medicines in both private and monastic pharmacies across New Spain. The blue-and-white painting is distinctive to the workshops of Puebla, Mexico. The three vessels show a range of functional, yet pleasing, design features that Puebla potters created for this practical ware. The slight hourglass shape of the vessels allowed them to be easily gripped. The tops of the jars are gently flared. They were probably covered with fabric or leather and tied with string or cord. The painter has left a blank area so that the name of the medicine that the jar contained could be written directly on the jar’s surface. The jars have special bases so that disc-shaped indentations could be cut in shelves to hold the jars neatly and securely. 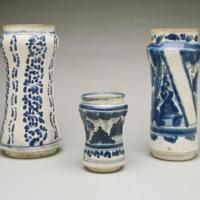 All three jars are typical of the genre, but were not necessarily made by the same workshop. The most common form of production, used for these and other Talavara vessels, included shaping on potter’s wheel, painting and firing. The smallest stands 12 cm (ca. 5 inches), the others are closer to 23 cm tall (ca. 9 inches). Ceramics of this type were purchased and used in a wide range of settings, from private homes to monastic complexes. Pharmacies were stocked with a wide range of herbs and chemicals that varied in their effectiveness. Most ill patients placed their faith in divine intervention as much as (if not more than) any a medical remedy.